Your wooden floors are the most important asset in your home or place of business. They not only open up space but ground any room. They’re also extremely valuable. In case of damages done to natural wood, it would take weeks and a sizeable sum to have them replaced, but there is a much more affordable and efficient way to erase any flaw – our wood floor restoration services. Wooden floors have a long architectural history and have graced every private and public building for centuries. Nothing conveys prosperity, worth and exclusivity quite like the rich finish of a wooden floor. Whether you have hardwood, softwood, parquet or cork, the expert technicians have the most skilled hands in London and their workmanship and know-how have turned our flooring restoration into a premier choice for residents and businesses in London. The professionals are courteous and understand how disruptive floor repairs are. What we excel at is delivering a service that minimizes disturbances to your daily activities. Thanks to the profession equipment from BONA, you also deal with no residue after sanding. Visit our Gallery Page for an in-depth preview of the floor restoration projects we have done in London. Assessment: Your floors are examined closely to determine how to best undertake their restoration. You receive a detailed report and suggestions for the best line of action. Repairs and Replacement: The boards with cracks and gaps are filled to minimize draft, while the floorboards in worst condition are replaced. Sanding: Remove tiny bumps, scratches, and splinters. You get rid of the worn finish and have a new canvas to paint on. The experts can deal with any ordinary residential parquet floors. 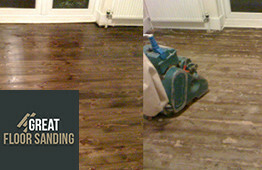 Moreover, they have extensive experience in sanding office, showroom, school and restaurant floors in London. Staining: With the fresh wood exposed, you have the chance to stain your wooden floors in a hue that better ties with your interior design. All staining products used are natural and preserve the wood for a longer time. Finishing: The final touch and the most important as this protects your wood from wear and tear. The eco-friendly products seal the wood for years and give you endless ways to customize your wooden surface. Contact Us to Schedule Your Restoration Appointment NOW! You’ve already made the biggest step. You’ve chosen to repair your wooden floor. The rest is easy. To get in touch with our friendly support staff, all you need to do is gives us a call at 020 3404 9697. Our lines are open at any time for you. You can call from Monday to Sunday from early in the morning to late in the day. We recognize the need to act fast when floor restoration is concerned, so we work even on holidays!